It took me all but one second to remember back to the first time I stood at the stove, on my stool, with my mother’s wooden spoon, staring into the rich concoction of thick milk, tapioca pearls, eggs, sugar – the smells combining to a heavenly scent. Stirring, stirring, stirring…. Just one rule – do not stop stirring. This was it! The torch had been handed over (or in this case, the coveted spoon). I did not take this first responsibility in the kitchen lightly. I could not mess this one up. I had waited too long for the opportunity. I also had some big shoes to fill. After all, here was a woman who could create sheer magic in the kitchen. In a post that I made in honor of Mother’s Day, I mentioned that my mom has “always been the happiest with her apron on, her sleeves rolled up, and hands full of wonderful sticky promises of what is to come. ” She has always feared nothing when it comes to experimenting in the kitchen. She thrives on the challenge – the more complicated the recipe, the more at peace she seems. I was now entering into her territory. Wooden spoon in hand, I was ready to help create what had already become my favorite dessert. It was the one recipe that I requested most. Even better was that it was the one recipe that my sister liked the least – all the more for me! I often would barely wait for the magic pudding to cool. As the vanilla was stirred in at the very end, I would immediately prepare for the warm (actually, still painstakingly hot) pudding to tease my tastebuds. My excuse was that I was testing to see if it had thickened up just so. I am unsure of whether it was my impatience. or just a preference, that, to this day, has me won over on the fact that tapioca pudding is best eaten when warm (or, in my case, HOT). It is usually written, in all recipes that I have seen, that it can be enjoyed either way (warm or cool). However, I believe that it is the sentimentality of it that keeps me clamoring for the way that the flavors meld when still warm – the milk and sugar mixing with the glorious pearls of tapioca and the eggs, and then, of course, that final touch….a splash of vanilla. I am not alone in finding a little gem in this simple five ingredient (six, if you count the pinch of salt) recipe that just screams of being the ultimate comfort food (and perfect if you just happen to be gluten free). Just recently, Lauren, a teen blogger (who seems to have better perspective on life than many forty year olds I know) and the mastermind behind a beautiful blog, The Celiac Teen, wrote about what Tapioca Pudding means to her since going gluten free. She, too, has an emotional tie to a dessert that, although may score low in presentation points, makes up for its lack of beauty with the comforting goodness of it’s flavors. Who knew that Tapioca Pudding could evoke such feelings? But today, as I gathered the ingredients together to create what is still one of my favorite desserts, I could not help but feel emotional as I watched my own son standing on his stool at the stove, with my wooden spoon. Stirring, stirring, stirring…. 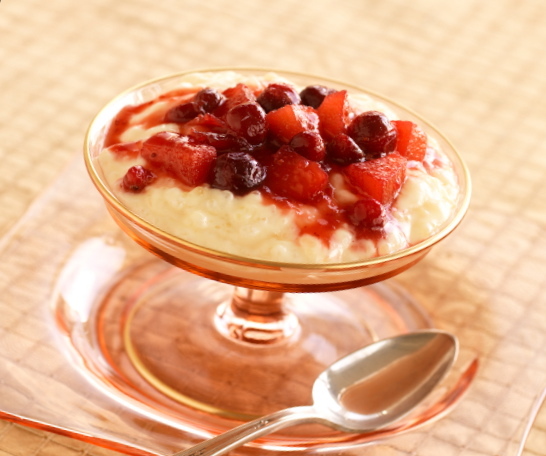 The recipe that I will share is from my mom, however, it is not different than many Tapioca Pudding Recipes scattered throughout hundreds of cookbooks and thousands of websites. What makes it special is that I am typing it off of a recipe card from my mother’s kitchen that was handed down to her by her mother (the most amazing grandma in the world, and the very woman behind my own mother’s un-matched confidence in the kitchen). 1. Combine the tapioca pearls, whole milk, and salt in 1 1/2 quart heavy-bottomed pan on medium high heat. Stir until boiling. Simmer for about 5 minutes, uncovered at the lowest possible heat, adding sugar gradually. 2 Beat egg yolks gently in a separate bowl. Then mix in some of the hot tapioca very slowly to equalize the temperature of the two mixtures (to avoid curdling and cooking the eggs). 3 Return eggs to pan with tapioca. Slowly bring mixture barely to a boil, stirring constantly. Reduce heat and stir several minutes at a low simmer, stirring constantly until you get a nice thick pudding consistency. 4. In another bowl, beat egg whites to soft peaks, then gently fold in the whites into the thickening pudding. Cool for about 10 minutes, then stir in the vanilla. 5. Serve either warm or chilled – however, you know my preference!!! Note that the recipe is supposed to serve 4-6. I must be honest and say that, although this is probably true in most cases, in my house, this will barely serve two. I do not have many indulgences, but put me in front of a bowl of Tapioca Pudding, and a lick left on the plate you would be hard-pressed to find. oh! also! Congrats on the mention on BEFREEFORME.COM !! I was so excited for you! I got my daily newsletter and saw a tag about an iphone app and I thought “naww it couldn’t be Kim’s” BUT IT WAS! You’re doing a service to so many people Kim Thanks! I miss tapioca pudding! YUM! Oh Kim, you are such a sweetheart! Thank you for the shoutout :). I loved reading about your emotions with the tapioca pudding – I remember having the same amount of diligence when I was allowed to stir anything :). You know what? I have never had this but after reading your post, I think I’ll be making this after we settled in to our place. Growing up tapioca was not something my family ate, but we did eat pudding a lot. And we always ate it hot with a little milk poured over it to cool it off. Even cold, my family has always liked it with milk. Wonderful post! Thank you SO MUCH for posting a dairy and egg free version of it! I’ve wanted tapioca pudding for so long but haven’t had the time to mess around to make it diary/egg free. Thanks! I’ll be trying it this week! I’m so glad you commented on my blog! Celiacs runs in my family, and I have quite a few people who really would benefit from your recipes! Thank you! I was JUST looking for a dairy-free tapioca pudding recipe KIm! Ya know, the only tapioca pudding I have ever had, came in a plastic cup, LOL! Thanks for the recipe Kim, I can’t wait to make it!